How Much Exercise Is Appropriate For a Young Irish Wolfhound? 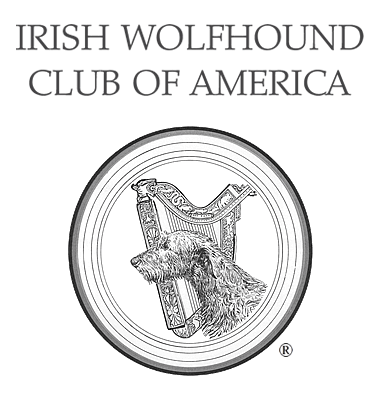 - Irish Wolfhound Club of America, Inc.
How Much Exercise Is Appropriate For a Young Irish Wolfhound? There has been a fair amount of debate regarding the proper amount of exercise for young wolfhounds. To the best of my knowledge, while there have been no studies on the effects of early exercise in puppies, studies in humans indicate physical activity through childhood and adolescence can lead to better bone mass and strength. Although bone seems to be very stable, this is a dynamic tissue that responds to the stresses placed upon it. In addition to the rapid growth in length and circumference seen in the early months of a puppy's life, the mechanical loading from exercise during this time affects the level of mineralization and strength of bone. This functional adaptation can help to minimize the potential for skeletal injury later in life. Tendons can also adapt positively to exercise. In addition to having a function in maintaining proper static structure, certain tendons have another important role in cursorial (running) animals such as horses and dogs, to act as springs to store energy for locomotion. Studies in horses suggest that early exercise is potentially the most important determinant in tendon development. Recommendations in horses clearly indicate that pasture exercise (unrestrained play and running) very early in life is essential for the development of certain tendons to be resistant to injury in adulthood, though additional “imposed” exercise may increase the risk of injury. And though no similar studies have been done in dogs, adaptation to exercise is well established in the horse and results in normal articular cartilage adapting to handle greater biomechanical stress, particularly in anatomical sites receiving high loads. Early exercise can potentially have a wide variety of other positive effects. The ability to run and play in open areas can teach a young dog balance and control of its body around obstacles. When young, falling and bumping into obstacles at slower speeds has less potential for serious injury than the same spill at high speeds while at play in a more mature animal. Deliberate practice of any physical activity will lead to an improvement in the ability to perform that task and a dog that does not start to run while physically immature will likely never have the physical ability and control of one who starts earlier in life. Osteochondosis dessicans (OCD) is a particular concern for many people raising young Irish Wolfhounds. OCD in dogs is a cartilage defect most often seen in the shoulder, but which may appear in a wide variety of joints. This condition is not completely understood, and while it definitely has a genetic component, it also is influenced by a variety of other factors which can increase or decrease its incidence, including nutrition and exercise or trauma. The affected weight bearing cartilage has a delayed maturation and becomes thicker and weaker than normal tissue. This decreases the nutrition the cells receive by the passive transfer of nutrients in the synovial fluid. The cartilage may go on to finish its growth without incident but significant force or trauma on the abnormal, weakened cartilage is believed to be one common cause of a pain-causing lesion in some individuals. Much more research has been done in OCD in horses than in dogs. In a study done in 1999 and involving a group of individuals descended from sires with confirmed OCD lesions, foals were separated into three groups, one which had free pasture access, one which was restricted to confinement in a box stall, and a the final group restricted to box stalls with added episodes of sprint exercise. At five months of age, all groups showed similar numbers of lesions. By 11 months of age, when all groups were allowed more free exercise, the number of lesions had decreased in all groups. The form of exercise when very young did not significantly influence the total number of lesions per foal but there was a tendency toward more severe lesions in the box-rested foals compared to the pastured individuals. So what do we do with our puppies? Individual dogs in this breed were selected through the ages to be fast enough to catch a wolf, then strong enough to kill it, so should be sturdy enough, in my opinion, to experience reasonable levels of activity without detrimental effects. There is a balance between necessary and excessive exercise in young giant breed dogs. Too little exercise prevents maximum strength and proper development of the musculoskeletal system. Too much or too forceful exercise can, however, damage these same tissues. In my professional experience, I tend to agree with the experienced breeders who allow their pups free play in areas large enough to allow galloping at will with pups their own age. I do NOT, however, recommend long or coaxed leashed walks, roadwork behind a bike, or excessive motivation to prolonged play, as in situations where “fence fighting” is possible. Pups should be prevented from running with adult IW's or with puppies of smaller breeds who may be much more coordinated than the IW's at the same age, except in very limited and supervised situations. Jogging distances with a human should not occur until after the last growth plates of the skeleton close at 13 to 14 months as repetitive impact particularly on hard surfaces is more likely to cause joint problems. And finally, pups should be prevented from jumping down from heights over 18 inches, particularly between the ages of four and nine months when OCD lesions are most likely to appear in the shoulder.